Jan 6, 2018-People who pass by the Patra Manjusha, the iconic red-coloured letter boxes of Kathmandu, might consider it to be an artefact waiting to be taken to a museum. Perhaps that is the reason why when Ram Krishna Basnet, a postman, struggles for more than a minute to open a corroded mail box in Thamel chowk, a sizable crowd gathers to witness the action. And as he finally cranks open the box, a sea of postcards—adorned with pictures of the Himalayas and of other tourist attractions of Nepal, spill out onto the street. “Three hundred postcards in total,” Basnet counts, but adds that the letter box in Thamel is a rare exception as it is continually used by tourists sending postcards back to their friends and family. 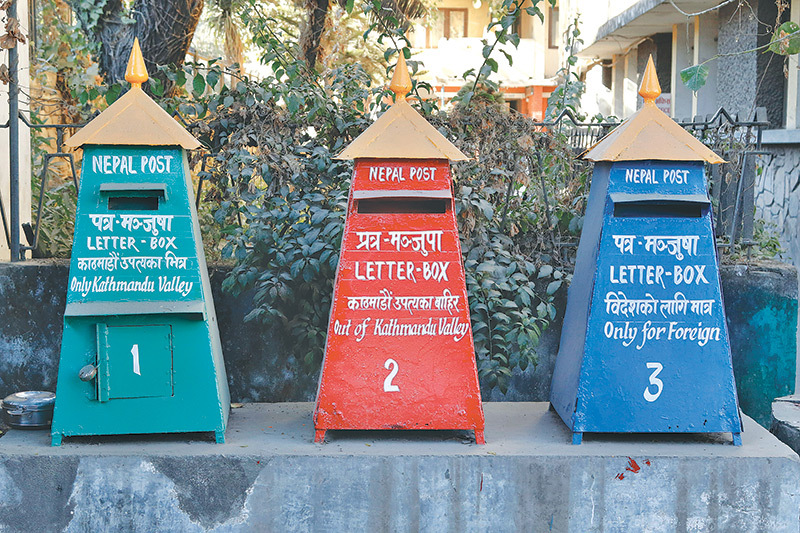 At the letter box in Swayambhu, for instance, Basnet collects four to five letters on a good day. “Eight years ago, I remember collecting a hundred letters everyday from Swayambhu,” Basnet recalls; but the decrease in volume of letters has not translated into less work for the postman who serves at one of the oldest institution in the country. The Nepali postal service, initiated by Bir Sumsher in 1878 AD, was once the only means of reliable communication available in Nepal. But now, with the easy access to the internet and telecommunication, the popularity of the postal service has declined. Sudha Regmi, the head of Philatelic Bureau at General Post Office, points out that the utilitarian function of the postal service has declined by about 20 percent in the last decade. However, postmen remain as busy (if not more) than when the postal service was the only dependable means of communication. Now that the trend of sending letters has declined, the postal service remains busy with various types of courier services. Hundreds of ‘Delivery on Same Day’ packages are accumulated every morning at Basnet’s office at the General Post Office in Sundhara. By the time Basnet arrives, a stack of sealed packages are ready to be picked up for delivery. On this day, after leaving his office, Basnet sets out to find a stationery store in Bhotahity Chowk to deliver an ‘ordinary letter’. In postal speak, an ordinary letter does not require the signature of the receiver, which makes Basnet’s work easier, as he does not have to wait for the recipient to acknowledge the delivery. But ‘ordinary packages’ are rare as most of the deliveries that Basnet handles throughout the day are ‘registered packages’, which requires of Basnet to fetch the signature of the rightful recipient. Sometimes it can be a minute’s work, while at other times he has to secure a number of stamps and signatures to keep a proper paper trail in case the delivery is questioned in the future—securing stamps and signatures, Basnet informs, can sometimes take hours. But Basnet happily goes through the ordeal of finding the right recipient, because, as Basnet points out, it is a matter of pride for a postman to have a successful delivery.